Registration is available now.The opportunity to buy tickets to WWDC18 is offered by random selection. Register by Thursday, March 22, 2018 at 10:00 a.m. PDT for your chance to join thousands of talented minds from around the world. 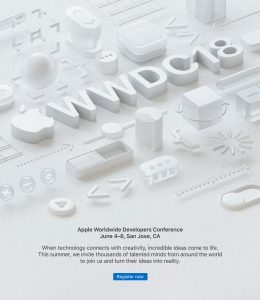 Note : To register, you must be a member of the Apple Developer Program or Apple Developer Enterprise Program as of March 13, 2018 at 10:00 a.m. PDT and agree to the WWDC18 Registration and Attendance Policy. Your membership must be current, valid, and in good standing from this date until the end of WWDC18. Developers between 13 and 17 years of age must have their submission completed by their parent or guardian who is an eligible member. If you’re selected, the default credit/debit card associated with your Apple ID will be automatically charged 1599 USD, or in local currency where available. If WWDC18 tickets are not available for purchase in your country using the default credit/debit card associated with your Apple ID, you may be asked upon registering to enter billing information for a credit card that can be charged in USD. To help ensure your payment is processed, we recommend that you notify your bank or credit card company that you may be charged for a WWDC18 ticket by Apple. WWDC18 tickets are non-refundable and for use by the selected applicant only. Tickets may not be sold, resold, bartered, auctioned, or transferred in any way. Engage in motivating conversations around key topics with fellow developers and Apple experts. Meet new people, consider different ideas, and encourage each other to reach new heights. Explore a variety of perspectives and gain valuable insights through compelling presentations given by industry experts and luminaries. Celebrate your week of inspiration and learning as you mingle with friends, hear exceptional music, and enjoy great food and drinks. WWDC18 will take place June 4-8, 2018 at the McEnery Convention Center in San Jose, California, USA. TM and © 2018 Apple Inc. One Apple Park Way, MS 96-DM, Cupertino, CA 95014.